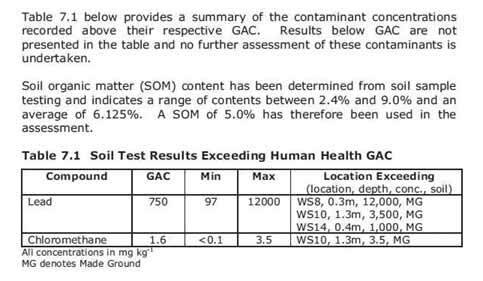 One of the concerns raised by the Grenfell Action Group in recent months is what level of ground contamination might exist throughout the site. Given the history of the site and the many previous industrial and other uses dating right back to the ‘Piggeries and Potteries’ period of the 19th century, these concerns would certainly seem to be justified. 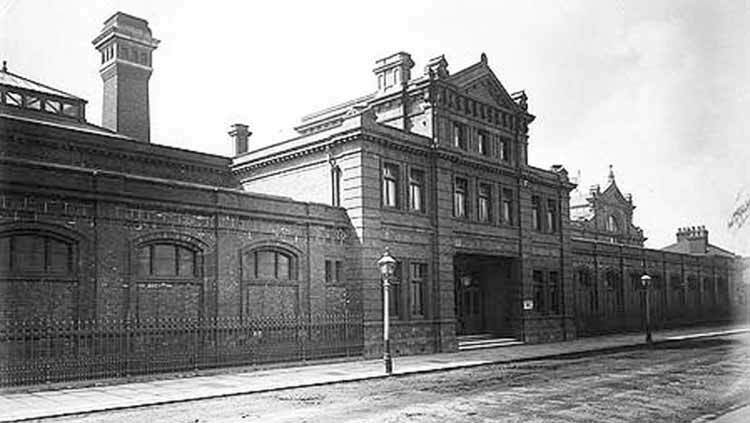 A significant proportion of the site, in the area earmarked for the academy complex, was formerly occupied by the Silchester Road Baths built in the 1880’s and demolished in 1979. The demolition rubble from this structure is believed to have been used as infill throughout the site, including the hilly parts of Lancaster Green. So, is the ground here contaminated with toxic material, and if so, where is it? The Planning Application for the KALC development includes a statement claiming that the planners had no knowledge of any contamination of the site, and did not suspect any. Please see the snapshot (below) of the part of the Planning Application form where this claim is made. However, the contamination assessment, also called the geo-environmental assessment, found toxic contamination, specifically lead and chloromethane, at several locations, exceeding safe human exposure levels. The lead contamination appears to be well above safe levels. Please see a second snapshot below. There is also the unresolved question of asbestos contamination which was also suspected by the consultants. At the time that the Silchester Baths was built in the 1880’s asbestos was widely used, particularly as insulation in industrial and municipal buildings. It would therefore seem highly likely that the Silchester Baths contained lots of it. Although the dangers of asbestos were known from quite early in the 20th Century, the full extent of the risk was not widely known or discussed until much later, and the first legislation to outlaw its use, and control its disposal, was not introduced in the UK until 1985. One has to wonder therefore, how much asbestos was uncovered during demolition of the Silchester Baths in 1979, and whether this was safely disposed of, or was simply buried with the other rubble on site. The contamination assessment fails to adequately answer this question. According to the report, asbestos testing was carried out at just five unspecified locations, where none was found. However, it is clear from the map showing the locations of all the test holes that very few asbestos tests were carried out within the footprint of the Silchester Baths, three at most, more likely two, and possibly only one. We should remember that only five locations were tested for asbestos throughout the entire site, including the Leisure Centre area. If we suppose a couple of tests over there, and at least one in the Lancaster Green mound (where lead was found), that leaves, at best, only two asbestos tests for the rest of the site. Maybe they were both in the car-park, and maybe they were not. Can we have confidence that the asbestos testing was adequate, and was correctly targetted ? And what about the lead and chloromethane? How dangerous are the levels found? How will the contamination be safely removed? And when, if ever, were they intending to share this information with us?